We like to have a good time, and help develop players to reach their potential. DM (armyofone#3163 on discord) me you if you would like to check us out. A link to your swgoh.gg profile in the DM is a plus. Mandalorians Reborned are looking for a few active members to fill out our ranks. We are a 145 Million GP Guild that has all raids on Farm. We are a high performing yet relaxed Free to Play guild. 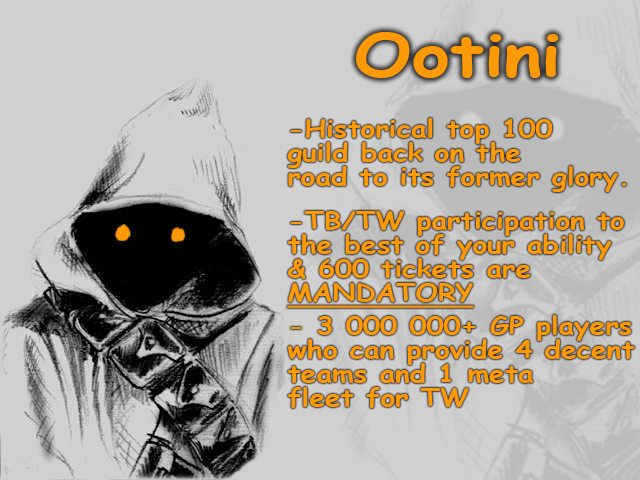 We just ask that you are active and get your 600 and fully participate in TW and TB for the guild. Discord information will be provided upon entry into the guild. KoR Resilience are currently looking for active players willing to contribute to the guild! We have all Heroic Raids on farm with raid times being in the US East time zone from 7pm-9pm. We are currently 42/45* for LSTB and 43/48* for DSTB. 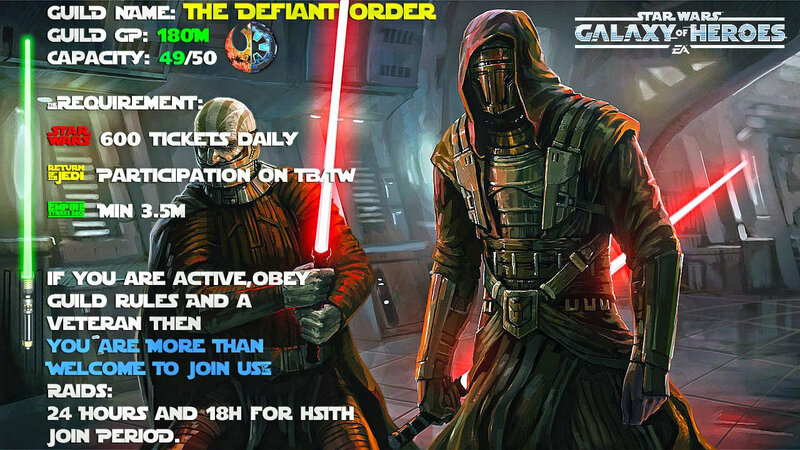 We are looking for active and friendly players who want rewards in a guild where your contribution counts. We are very easy going and have a lot of experienced players willing to help people improve your teams if interested. * HPit, HAAT, HSTR auto run without issue and quickly. **Participation** - Have fun! Help the guild in TW and TB! Looking for people at 2.5M GP. Feel free to come and talk to our officers before making a commitment. 149M GP guild looking for 1 more active member. We are a very active guild with a large roster of folks who have been with the guild since it's formation over 2 years ago, including the core officers. Though we're proud of the community we've built in-game, we may be most proud of our Discord Happy Hour. We are interested focused rosters, even if under 2.5M GP. Rogue 1 would be extremely helpful as it will help propel us to 43* in TB. Das UƝİTΞĐ ΞMƤİRΞ [UΞ] steht für Zusammenhalt, gesundes Wachstum eines echten Verbundes! Es war einmal vor langer Zeit, in einer weit, weit entfernten Galaxis…. Das United Empire ist auf der Jagd um sein Territorium zu vergrößern. Bist du den Punkten kritisch gegenüber, kannst du wieder zu deinen Hinterwäldler Ewoks zurück kehren und auf den Todesstrahl warten. **** unsere Wings immer die beste Truppenstärke aufbieten können, suchen wir dich halt du Heinz! Manchmal ist Mittwochs auch noch Bongotag, das wird aber meist entschieden wenn von Sonntags noch Kekse übig sind! Jeder der Aktivität zeigt, sich an Farmaufträge und die Regeln hält, hat einen festen Platz bei uns! Falls DU jetzt denkst oh Mist!, ich erfülle diese Anforderungen nicht. Keine Panik und komm auf den Server! Wir finden etwas passendes für dich. Wenn du dich mit unserem Spirit und unseren Regeln zu 100% identifizieren kannst, freuen wir uns darauf dass du das UƝİTΞĐ ΞMƤΊRΞ mit deinem Charakter ergänzt! Welcome to Warriors of Echo! We are a competitive Top 100 guild with a friendly and helpful atmosphere. We are also aware that real life sometimes intereferes with our favourite game, just talk to us in that case. We are loosely affiliated with Team Instinct, but are an independent guild. We use Discord. Well structured discord channels with very helpful guildmates around. First and foremost being active in all guild events and at least posting a 0 on raids! try to compete in TW and accept help/suggestions if needed. Please don't hesitate to contact us, even if you don't meet all the criteria, not all of them are a must. If you are interested and want to join us or have any further questions please contact us on discord! Looking for 3 dedicated members with a Tb focused roster. If you’re looking for a solid, mature community and management group that can help you in all areas of the game, this is it. We can help you focus and grow your roster by maximizing your rewards. suchen aktive Mitstreiter aus dem gesamten Eurovision Raum oder wo auch immer ihr Euch im Universun rumtreibt. Look no further. We're an extremely good guild with an amazing record in TW. More importantly, we're also genuine, honest guys, who make playing the game fun. Doombringer is an independent guild at 159m GP with 48 members currently. We therefore seek 2 additional high quality players. We are a really open minded bunch mostly from UK/western Europe and the US. We follow a pretty simple and straightforward mindset: "The real world always comes first, but when you play the game give 100%." If this sounds good, contact me via Innamora#7076 on Discord and we'll chat about whether we are a good fit for each other. UK based guild with +/- half of its members from US. 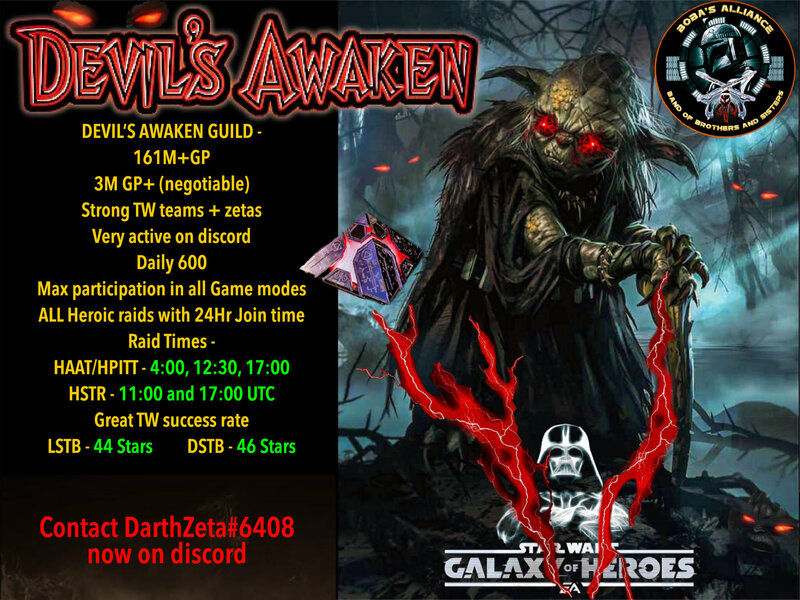 Foundation of (6) guild community is looking for dedicated players eager to bring their A game for TB/TW. 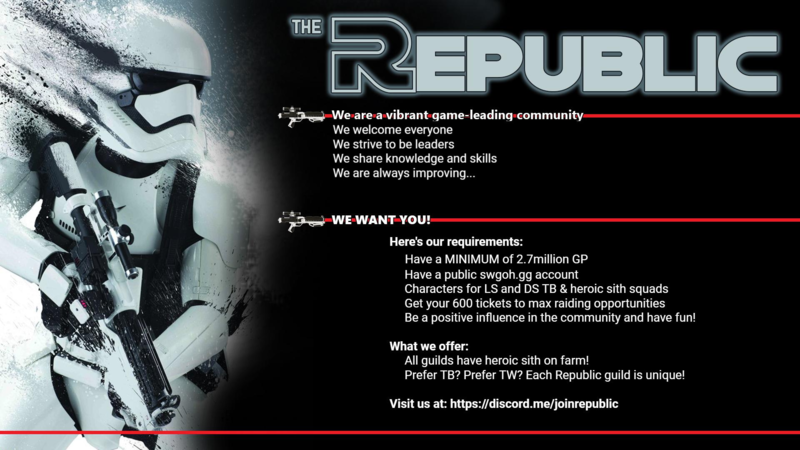 The REPUBLIC is a vibrant, game-leading community with a rich history. 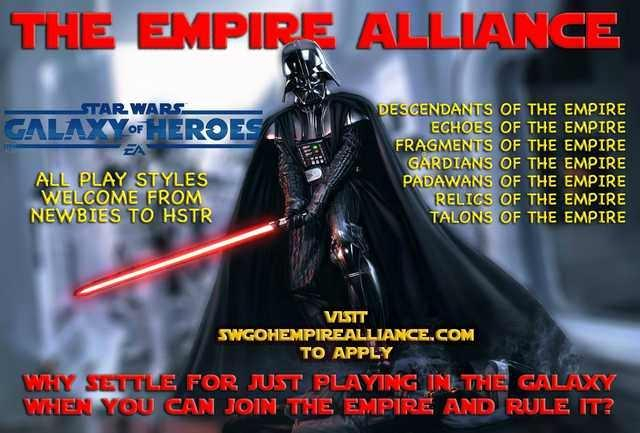 We are a family of 11 guilds with diverse rosters all farming hSTR and 1 casual guild. We welcome players of all backgrounds and ages from around the world. We offer different TW and TB focused guilds including guilds in the top 100. Tired of losing TW? Tired of not getting enough stars in TB? Want an Active Guild which farms hSTR? Do you want to be in a progressive guild where the members help one another improve? Do you want to know all about new game content as it comes out? 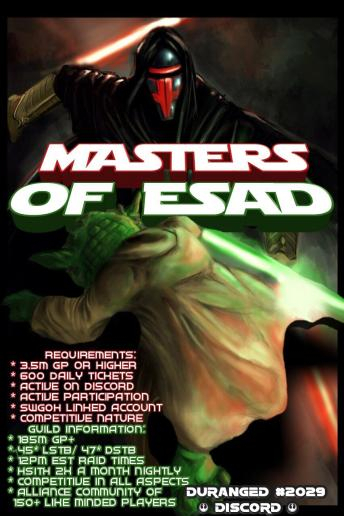 Do you want to reap the rewards of being a part of a winning guild? Stop by our discord server and have a chat, some of our guilds are even on the top 100 leaderboard in TW and TB. We are a fun and helpful community which strives to keep every member happy with the progress. 2.The toons needed for LS/DS TB and toons required for heroic sith. If this sounds like a community you want to be a part of, and thrive in, visit us at https://discord.gg/vRWWd7u and let us know! 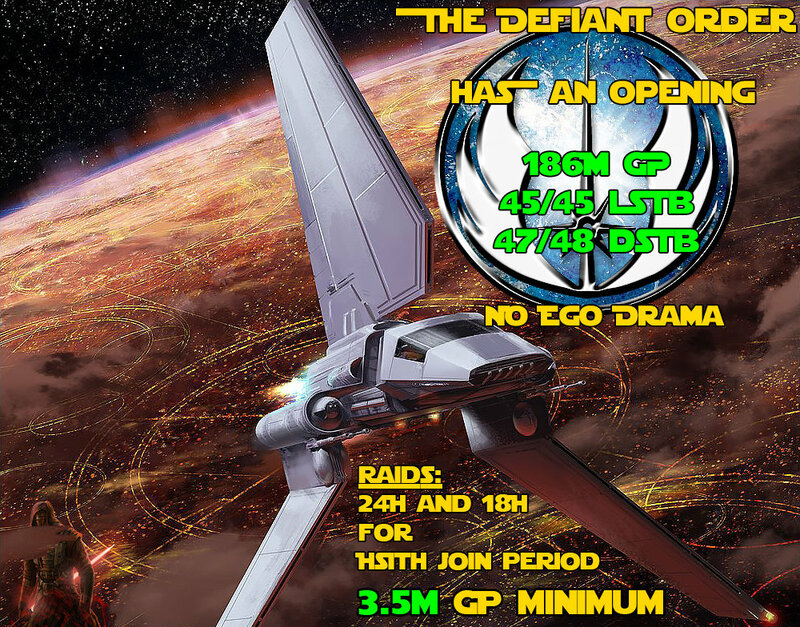 We are looking for 3 equally amazing new members that have 2.5m + GP plus RJT or Revan or 7* C3PO (i.e. can contribute materially to hSTR). We do have some TB, TW and general guild rules but are pretty relaxed overall and want members that communicate/use Discord and are friendly and tolerant.